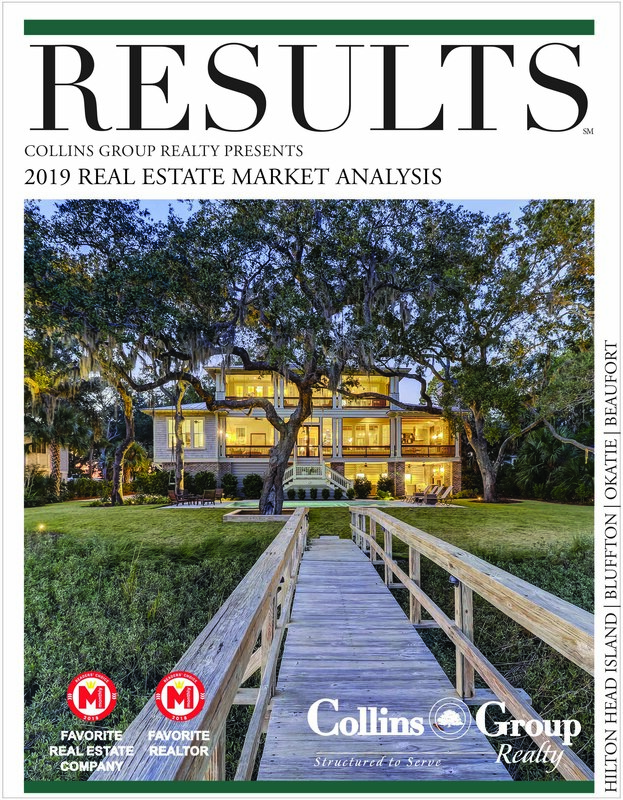 Consider this stunning waterfront townhome in picture-perfect Windmill Harbour on Hilton Head Island, South Carolina! Exuding the utmost in elegance and quality finishes throughout. Built in 1998, 41 Harbour Passage E received a six-figure facelift in 2012 with over $100,000 invested in the kitchen alone. 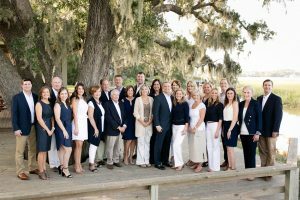 A private, full-size custom-built pool and spectacular outdoor living area were added in late 2011, completing this property and transforming it into a true Lowcountry outdoor living environment. 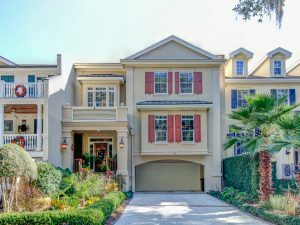 Situated on a quiet and charming street, this Charlestonian-style residence beckons you with its lush landscaping and curved wrought iron staircase. Offering ample parking for both residents and guests, the 3+ car garage provides enough space for the storage of either a golf cart or a small watercraft, and includes a thoughtfully located climate-controlled storage area. Designed to maximize breathtaking views and offer superb outdoor living space, the custom built outdoor living space is accessed by a spiral staircase off of the first floor deck and features a private, full-size pool. A spectacular centerpiece overlooking the marshfront, it features a relaxing seating area with spa jets. Plus, a “chiller” feature allowing the pool to be chilled to a comfortable temperature on even the hottest South Carolina summer day. 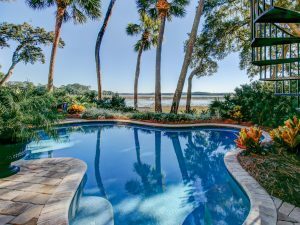 The pool was installed by Year Round Pool Company with a self-cleaning system for easy maintenance and has been plumbed for the addition of a gas heater. Floored with custom brick pavers, the cozy covered patio has an outdoor kitchen area for a gas grill. 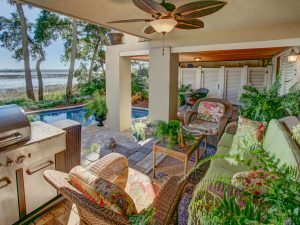 The covered patio also has a sitting area with a ceiling fan, making this an ideal location for entertaining or relaxing. Additionally, the rear of the home features a private yard along the waterfront bulkhead, perfect for a hammock. Other outstanding features of this townhome include 2 utility rooms, a climate controlled room off the lower patio/pool, 3M film on all windows and a new roof (2017). Entering this fine home through the solid mahogany door, complete with beveled casing, the entry foyer guides you up a half flight to the main living level and down a half flight to the garage level. 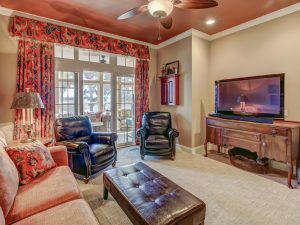 A charming hallway leads past the two story staircase and opens up to the welcoming great room featuring hardwood floors, extensive custom built-in cabinetry, newly redesigned marble-encased gas fireplace, crown molding, recessed lighting, ceiling fan and beautiful views of Jarvis Creek. Perfect for entertaining, and adjacent to the kitchen, is the dining area complete with hardwood floors, brushed nickel chandelier, breakfast bar with granite counters and custom cabinetry. The wet bar features a hammered copper undermount sink, mini-fridge, granite counters and glass shelving. The redesigned kitchen is spectacular featuring a full Dacor appliance package – a chef’s dream! The stainless steel Dacor appliances include a 6-burner propane gas range with pot-filler faucet and custom cabinet-encased vent hood, wine cooler, self-cleaning convection oven and microwave, warming drawer and a state-of-the-art side by side refrigerator and freezer with pull out drawer below. It also includes the finest custom cabinetry (featuring soft-close drawers and built-in pull out shelving), granite countertops with full bullnose, walk-in pantry with custom pull-out shelving, custom tiled designer backsplash, and 12” deep composite granite basin sink. 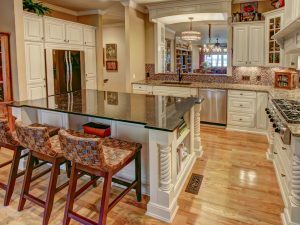 A center island provides for both an eat-in kitchen and spacious food preparation area. Also located on the first floor, conveniently located just down from the dining room and kitchen, is a private powder room with pedestal sink and sconce wall lighting. The first of the home’s two master suites is located on the main living level. This room features volume ceilings, Berber carpeting, crown molding and decor ceiling fan. The bathroom features a granite-topped dual vanity with undermount sinks, walk-in closet, oversized tub and separate walk-in shower. 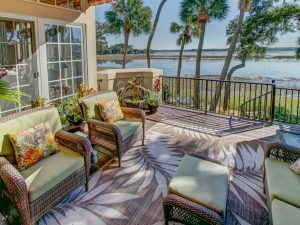 Located just off the downstairs master, a beautiful Carolina Room provides the perfect area to savor spectacular sunrises and marsh-to-creek views. 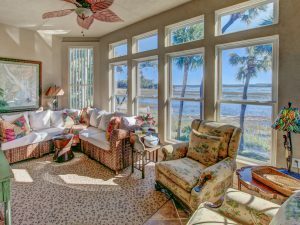 The Carolina Room boasts wall to wall waterfront windows, oversized tile flooring, ceiling fan, as well as access to the living room and an oversized rear deck. 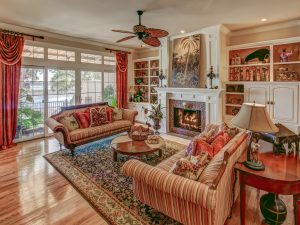 The second story of this residence welcomes you with custom built-in cabinetry in the hallway, as well as inviting, designer-decorated window seating along the light-filled stairway landing. 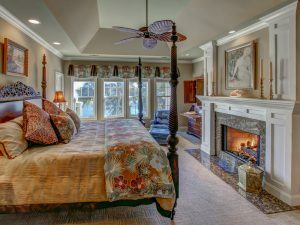 The sumptuous second level master suite offers the promise of ultimate relaxation and boasts a cozy den with a wet bar featuring granite counters, mini fridge, custom built-in bookcases, ceiling fan and custom millwork. The generously sized bedroom features a marble-surround gas fireplace, tray ceilings, custom built-ins and upgraded berber carpet. 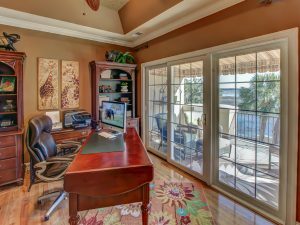 There is a private waterfront office with walk out to the upper-level porch, covered by a custom awning. Enjoy the oversized walk-in closet with custom cabinetry and laundry facilities. The spa-like master bathroom includes a Jacuzzi tub and separate walk-in shower, dual vanity with granite counters and upgraded oil-rubbed bronze fixtures. The second floor en suite guest bedroom includes upgraded berber carpet, decor ceiling fan, and a large walk-in closet. The private bathroom features a granite topped vanity and undermount sink, tile flooring and a walk-in shower.